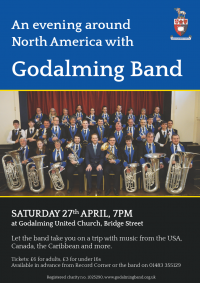 Godalming Band invites you to an evening concert at Godalming United Church, where the band will take you on a musical trip around the North American continent! Featuring music from the USA, Canada and the Caribbean plus classic brass band pieces. Tickets are £6 for adults, £3 for under 16s, available in advance from Record Corner (Pound Lane), or from Dominic on 01483 355129 or by email pro@godalming.band. Find the band’s full summer programme at here or on Facebook.